Banquet Tables Pro plywood highboy tables feature a 3/4" thick 11 ply birch plywood top. The top has a UV coat on both sides. The UV coat will protect your table from spilled cocktails & other liquids. This highboy table is very lightweight. The 30" round only weighs 19 lbs! Combine that with the fact it breaks down into 3 pieces easily & quickly, and you can see why it's the best choice for the event & rental market. Basic option comes standard with 2 height columns. (30" and 42"), single adjustable column upgrade available. 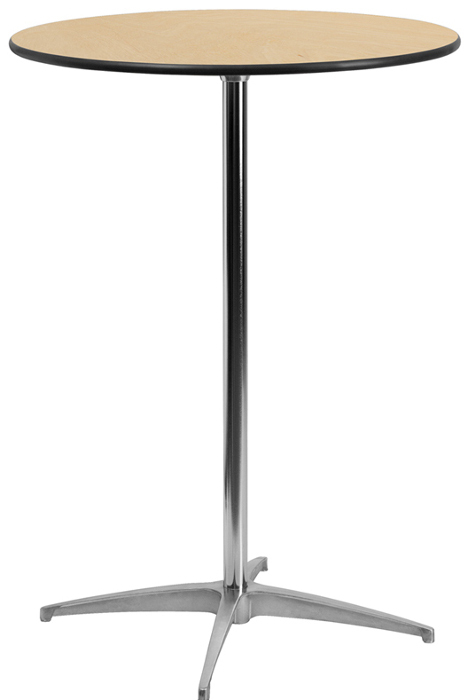 Also Available Adjustable Height Column (3 preset heights 30,36,42).